InTouch Trout Spey - A full length, no loops, easy casting, short head style perfect for soft hackles and small streamers. A scandi type line made to fish tapered leaders, versileader, (poly) leaders or light sink tips. The INTOUCH TROUT SPEY line is a very easy casting, short head style line for anglers using light two-handed trout Spey rods, and regular single-handed fly rods (just check the grain weight to match). Each line is built on RIO's ultra-low stretch ConnectCore for maximum sensitivity, and is built with a seamlessly integrated running line for ease of use. Anglers can attach regular leaders or VersiLeaders to the front, and these lines are perfect for nymph and indicator rigs, soft hackles and small streamers. Also available in a "Shooting Head" version. 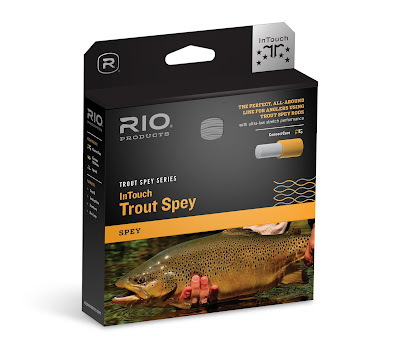 Find RIO Spey and Trout Spey Lines at "The Gorge"